Capacity building looks at developing the infrastructure, institutions and people and is critical to the development and participation of humans in the economy and society. Capacity building ranges from schools, roads and hospitals through to health and welfare systems, education, communication and information sharing, participation and voice, governance and opportunity. 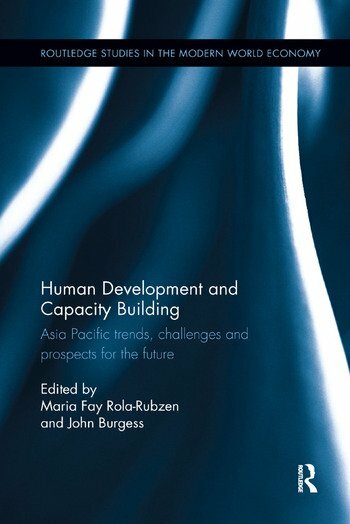 This book aims to outline the nature and scale of the capacity building challenges facing countries in the Asia Pacific region. Human Development and Capacity Building presents case studies from selected countries with an emphasis on rural development and programs that enhance opportunity and participation in the economy. It focuses on issues arising from women development in Pakistan, indigenous union voice in the French Pacific, job creation programs in Indonesia and the role of international aid and labour agencies in capacity building in Myanmar. The rich coverage will be of invaluable use to those interested in capacity building. Maria Fay Rola-Rubzen is Deputy Dean of Research and Development and Associate Professor at Curtin Business School, Curtin University. Dr Rola-Rubzen is an economist with over 25 years of experience in international development in various countries in Asia, Africa and Australia. John Burgess is a Professor of Human Resource Management at Curtin Business School, Curtin University, Australia. He is also one of the authors of Diversity Management in Australia: Theory and Practice.